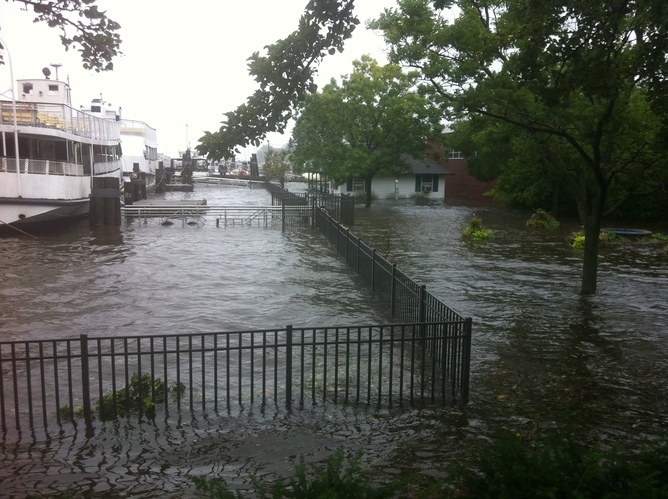 You are here: Home » CCNF Headline News and Reports » Climate Change and Hurricane Katrina: What Have We Learned? Instead, the two papers inspired a media firestorm, polarizing popular opinion and, to some extent, scientists themselves, on whether global warming was in some way responsible for Katrina. While the firestorm was mostly destructive, benefiting only the media, it had a silver lining in inspiring a much more concerted effort by atmospheric and climate scientists to understand how hurricanes influence and are influenced by climate. We have learned much in the intervening years. An obvious point is that slowly rising sea levels increase the probability of storm-induced surges even when the statistics of the storms, such as top wind speed, themselves remain stable. Storm surges are physically the same thing as tsunamis but driven by wind and atmospheric pressure rather than the shaking seafloor, and they typically arrive near the peak of the storm’s fury. 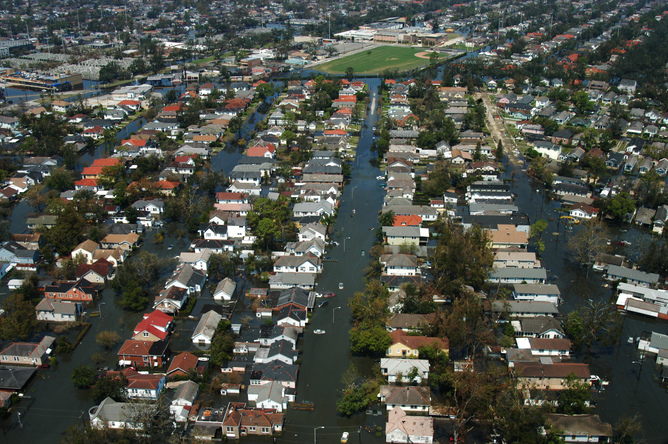 As with Katrina and Sandy, they are often the most destructive aspects of hurricanes. Had Sandy struck New York a century ago, there would have been substantially less flooding, as sea level was then roughly a foot lower. As sea level increases at an accelerating pace, we can expect more devastating coastal flooding from storms. A NASA retrospective of Hurricane Katrina build-up done on the five-year anniversary. What about the storms themselves? Hurricanes are giant heat engines driven by the thermodynamic disequilibrium between the tropical oceans and atmosphere. This disequilibrium drives a strong flow of heat from the ocean to the atmosphere and is a direct consequence of the greenhouse effect: the tropical atmosphere is so opaque to infrared radiation that the sea surface cannot cool very much by directly radiating heat to space. Instead, it cools mostly by the evaporation of water, the same mechanism by which our sweaty bodies cool on a hot day. To maintain this evaporation, the sea and atmosphere must be in a state of thermodynamic disequilibrium. As we add greenhouse gases to the atmosphere, this thermodynamic disequilibrium must increase so that cooling by evaporation can compensate the loss of direct infrared cooling to space. The theory of the hurricane heat engine places an upper limit on hurricane wind speeds. Called the “potential intensity,” it is directly proportional to this disequilibrium. Virtually every study that has been done, dating back to 1987, shows increasing potential intensity in most places as our climate continues to warm; the average trend is about 10 miles per hour (mph) for every degree centigrade of tropical sea surface temperature increase, or roughly 20 mph for each doubling of atmospheric CO2 concentration. Twenty miles per hour might not seem like all that much, but economists and engineers tell us that damage from windstorms increases very rapidly with wind speed. The actual situation is much more interesting than one might at first suspect. Human society is well adapted to common events. In Boston, a 50 mph wind will not do much damage because it occurs quite frequently and infrastructure is well adapted to it. But a 70 mph wind, which is far rarer, will cause quite a bit of damage. As a loose rule of thumb, societies are well-adapted to events that occur, on average, once every generation or two. In many places this is codified in building codes, insurance contracts and other policies that are based on or insist on resistance to 100-year events; that is, events with an annual probability of 1%. But to keep costs down, a structure engineered to survive a 100-year wind speed of 100 mph may very well fail at 110 mph. Typhoon Haiyan is a case in point. The Philippines are regularly hammered by Category 5 typhoons, but it is rare that we hear about these because they seldom do much damage. In the region near Tacloban, the 100-year storm will have a landfalling peak wind speed of about 170 mph. But Haiyan, probably the strongest hurricane or typhoon ever to be recorded at landfall, had wind speeds upwards of 190 mph, accompanied by a phenomenal storm surge. The difference between 170 mph and 190 mph in this case was more than 6,300 deaths and almost total devastation. This is what happens when events start to fall outside generational experience. Theory and computer models show that the incidence of the strongest hurricanes – those that come closest to achieving their potential intensity – will increase as the climate warms, and there is some indication that this is happening. But these most destructive, high-category storms constitute only around 12% of the world’s tropical cyclones; the great majority do little damage but occur far more often. Both theory and most models predict that, ironically, the frequency of such weaker storms should decline as the climate warms. Satellite data also show that storms are reaching their peak at higher latitudes, consistent with theories and models. This may portend reduced risk in some of the deep tropics but increased risk in middle latitudes. In general, systematic changes in hurricane formation regions and tracks are of as much concern to us as changes in the overall statistics of storm frequency and intensity. So too is the expected large increase in hurricane rainfall, which drives hurricane freshwater flooding, the second deadliest consequence of these storms after flooding from storm surges. Global warming is occurring far too fast for effective human adaptation. The next ice age, like the last one, may very well put a mile of ice on top of New York City, but it will take so long for that to happen that most of us will not even notice our collective adaptation. In contrast, adapting to the myriad changes expected over the next 100 years is such a horrendous prospect that otherwise intelligent people rebel against the idea even to the extent of denying the very existence of the risk. This recalcitrance, coupled with rising sea levels, subsiding land and increased incidence of strong hurricanes, all but guarantees that New Orleans will have moved or have been abandoned by the next century. Author: Kerry Emanuel Dr. Kerry Emanuel is the Cecil and Ida Green professor of atmospheric science at the Massachusetts Institute of Technology, where he has been on the faculty since 1981. Professor Emanuel's research interests focus on tropical meteorology and climate, with a specialty in hurricane physics. He is the author of two books aimed at a general audience: Divine Wind: The History and Science of Hurricanes, and What We Know about Climate Change.